Oops! It’s nearly the end of December, and I’ve just realised that in the battle of home improvements v Christmas preps, I forgot to post the November edition of the Cuttings Calender. Now, I don’t want any of you wondering if I’ve fallen by the wayside, so better late than never. It’s starting to get harder now, with fewer blooms around, so November started with the last of the floral stragglers and ended with evergreens and berries. I love the winner for its colour scheme of silver (foliage), black (berries) and purple (berries and flowers). The only flowers still blooming were good old Astrantia “Buckland”, which I twinned with the silvery foliage of Pittosporum “Silver Queen” and Astrantia ludoviciana. Sorry, there was also still a few blooms of Verbena bonariensis, standing proud, so they started the purple. Down in the woodland I was enamoured by the matching Callicarpa berries and Muscari flowers, so I wanted that effect in the vase too. What better contrast to all of this than black berries, supplied by Ophiopogon “Nigrescens”. So cool! There were other contributions, despite the slowing down of offerings. Centre stage in this vase has to be the winter flowering Coronilla “Citrina” flowering alongside summer flowering Alchemilla mollis. Crazy! Astrantia is still going strong, golden ivy leaves blend in with the flowers, and the ever flowering Campanula (not sure which one but it loves our garden!) provides a cool blue contrast. Don’t the vases seem to flow from one to the other? 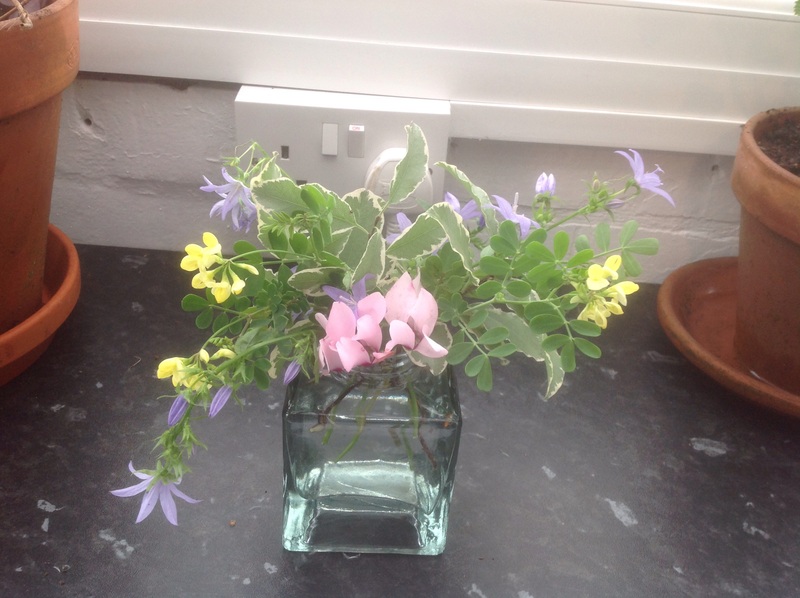 Here we have the Coronilla and the Campanula again, this time with more silver variegated Pittosporum, but this time with a splash of warming pink, from the Cyclamen. Now we’re getting more seasonal! Some good evergreen leaves – Sarcococca and Ivy – a beautiful sprig of Jasmine foliage turning gold and pink, with the last of the red berries and some red Cornus stems. 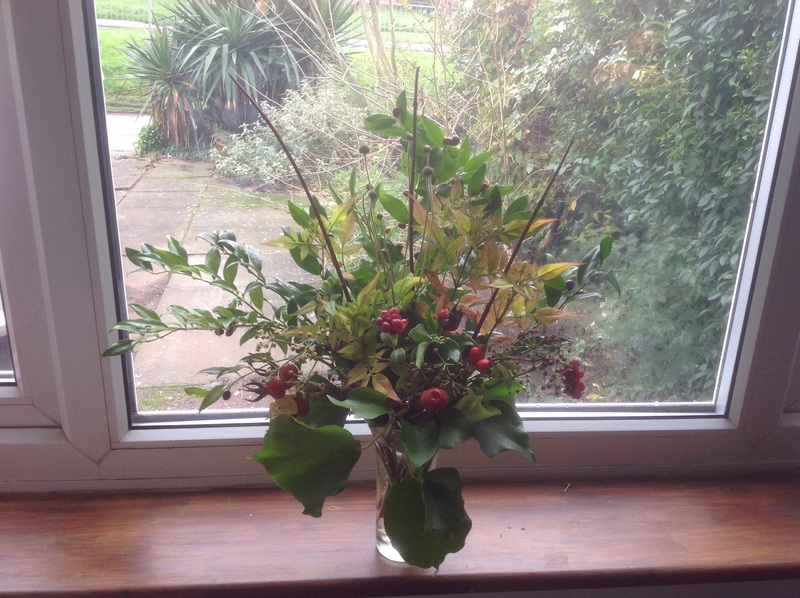 I added some black “full stops” with some ivy berries and a stem of seed heads from Anemone japonica. A difficult choice this month! So sorry this is so late. December’s will be due any day now! 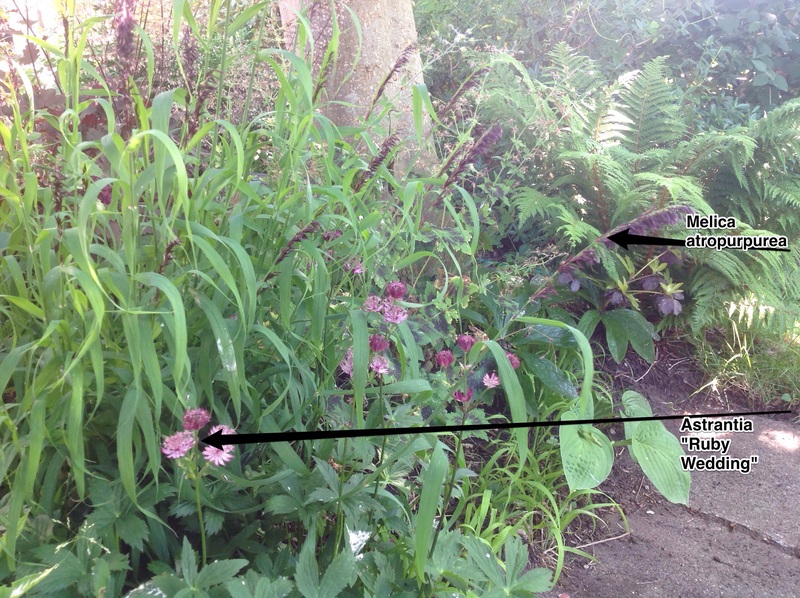 This entry was posted in The Cuttings Calender and tagged astrantia, Berries, Coronilla, Cuttings, Cyclamen on December 30, 2014 by thelonggardenpath. 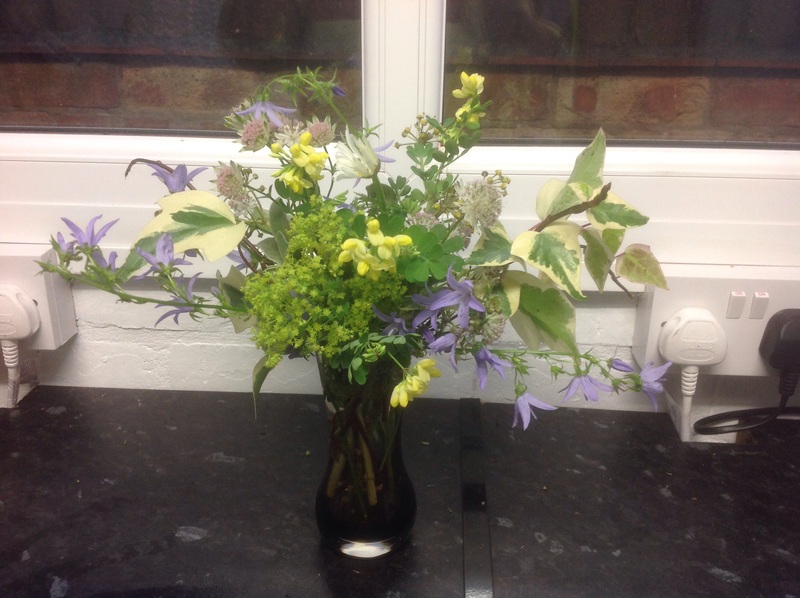 In a Vase on Monday – Here’s One I Prepared Earlier! Congratulations to Cathy, at Rambling in the Garden, for one year of her most enjoyable meme, ‘ In a Vase on Monday”. Her posts are so informative and encouraging – not forgetting beautiful, too! I, too, strive to have a continuous stream of cut material in the house, having set myself a target of achieving this for one year, at least. Unfortunately, I have rarely taken part in the meme myself, mainly due to working on a Monday, and now coming home in the dark, but I really wanted to join in this week to celebrate Cathy’s achievement. So, I have to spill the beans! As in good old Blue Peter style, “Here’s one I prepared earlier”! My thinking is, that, even though my vase was collected yesterday, it is still in a vase on Monday! Do you agree? I do hope so! As most of you who join in will probably agree, material is starting to get scarce. I could also name this post as “The Last of the Summer Flowers”, as that was my starting point. I scoured the garden for blooming stragglers, and came up with some Astrantia “Buckland” and a surprise spray of Alchemilla mollis. So they started it off and dictated the colour sceme. Foliage was needed to pad it out and I chose some variegated Ivy to pick up the lemon, and some silvery leaves of Phlomis fruticosa. Our long flowering Coronilla “Citrina” has just started again, (definitely not a summer flower! 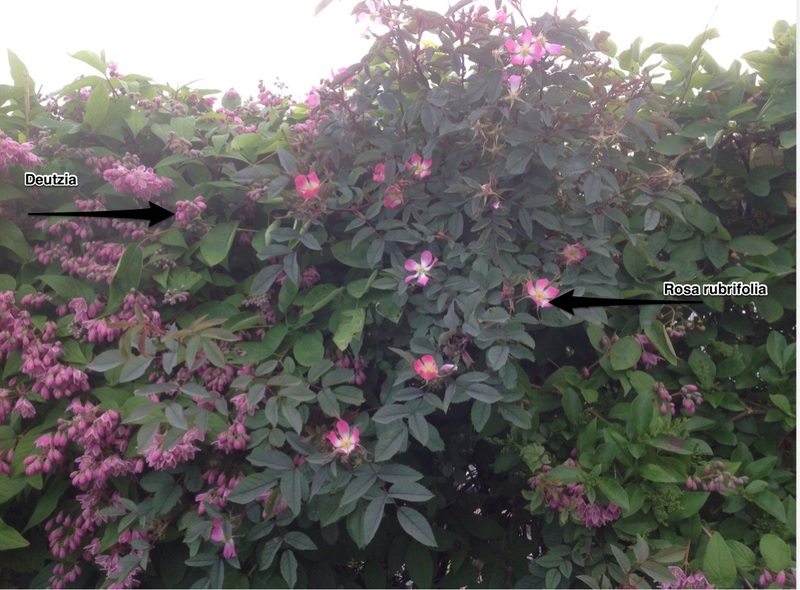 ), so their lemony flowers added scent as well as colour. 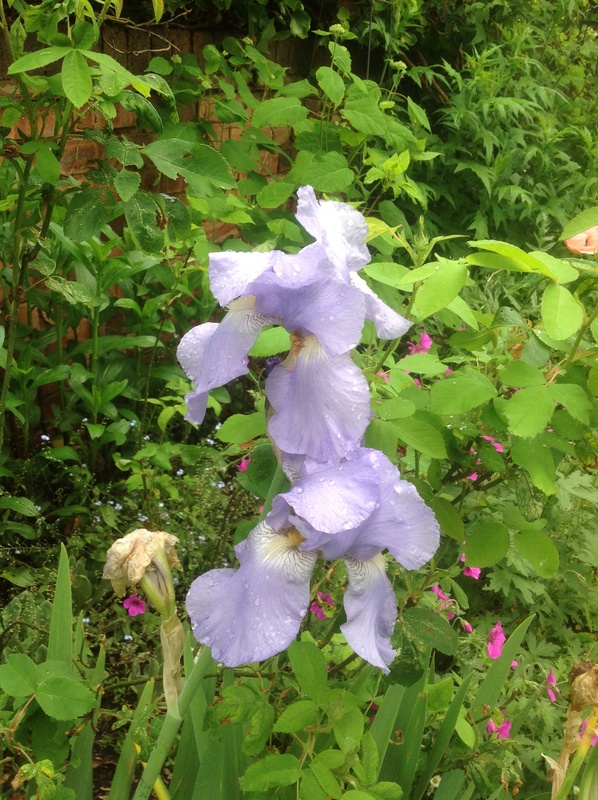 All that was needed now, was a touch of blue, courtesy of a campanula which is happily self-seeding itself around the garden, and blooming well just now. They add contrast and a trailing element to the composition. Oh, and a solitary Ox-eye daisy, just ready to flower, was added in the centre for good measure. All that’s left now, is to thank Cathy for her inspiration, and encouragement. Well done on 1 year! 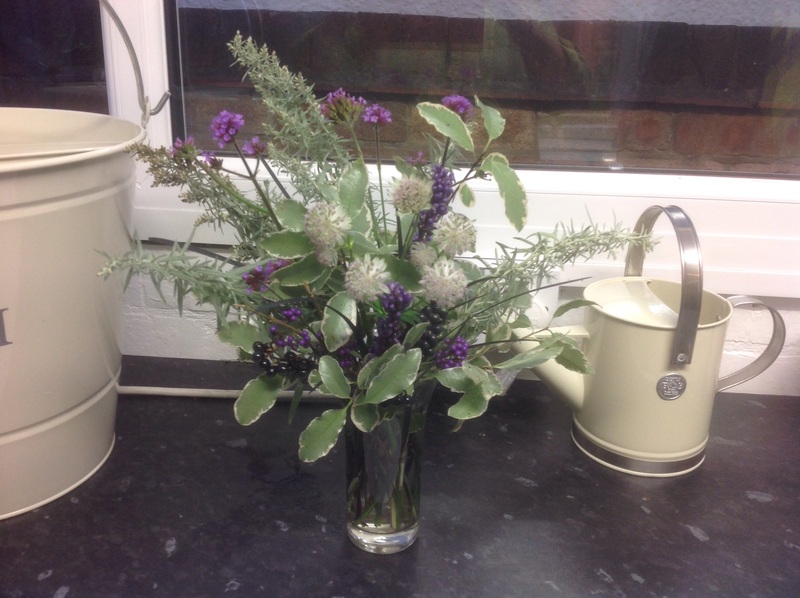 This entry was posted in Uncategorized and tagged astrantia, Campanula, Coronilla, cut flowers, Ivy, Leucanthemum, Phlomis on November 10, 2014 by thelonggardenpath. All the buds are now well and truly bursting! The Cottage Border is showing its first wave of flowers. 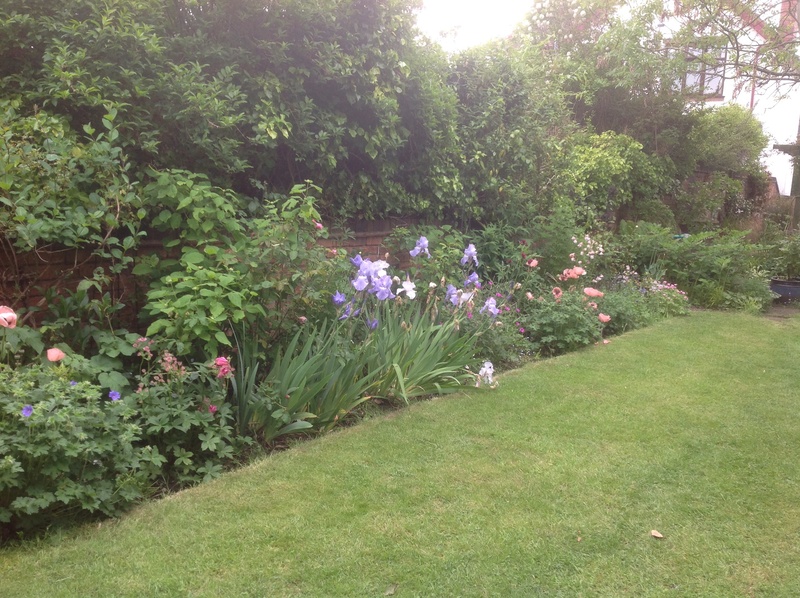 The irises, pink poppies and aquilegias have been flowering now for a while, and geraniums, and the first of the roses, are starting to join in. 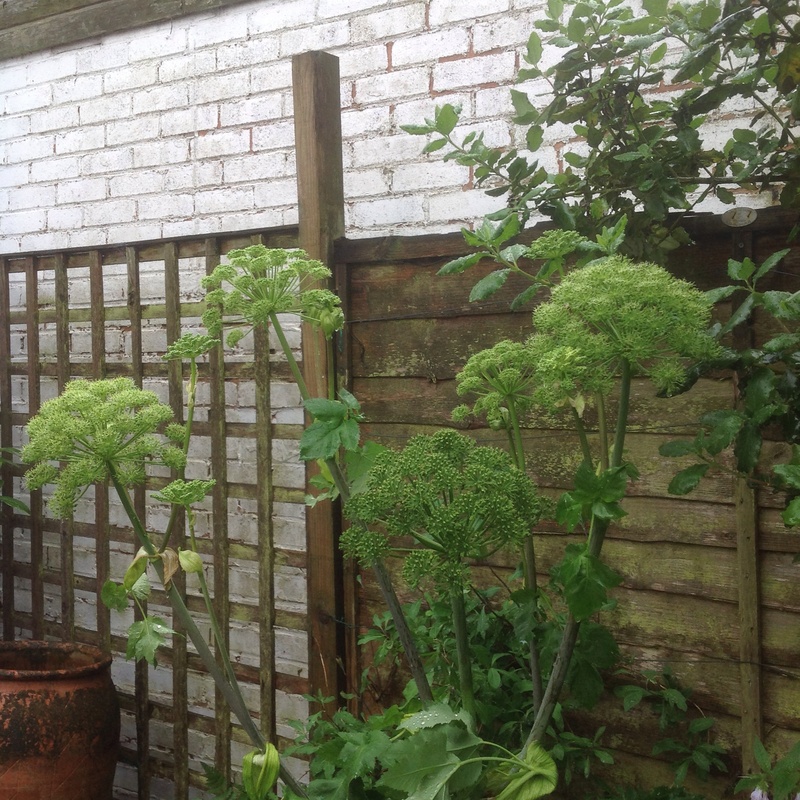 The Angelica buds I showed you last month, have exploded now. I’ve counted 14 flower heads! Quite dramatic. 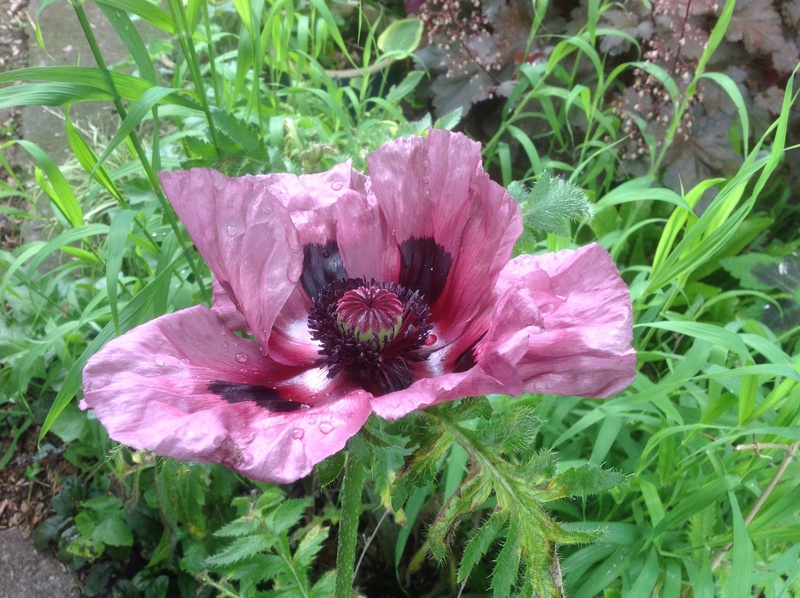 If only it was perennial! The allium bulbs are blooming now. 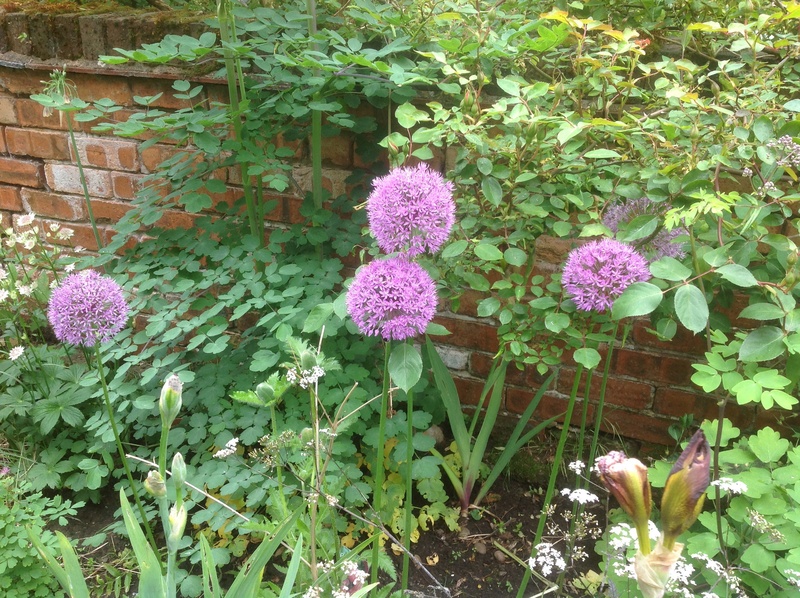 I think they’re Allium aflatunense. 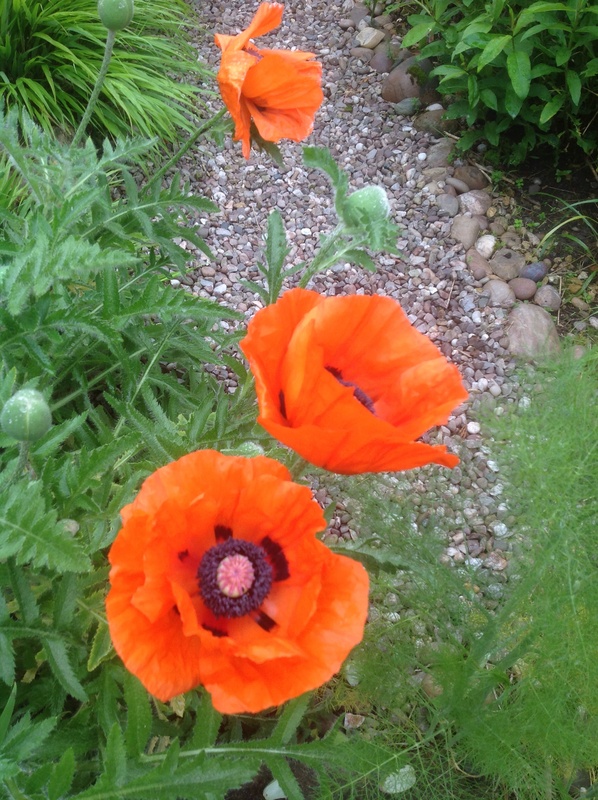 They have been there, under performing, for several years, and now that I have revamped this bit of border, they have decided to remind me they are still there. 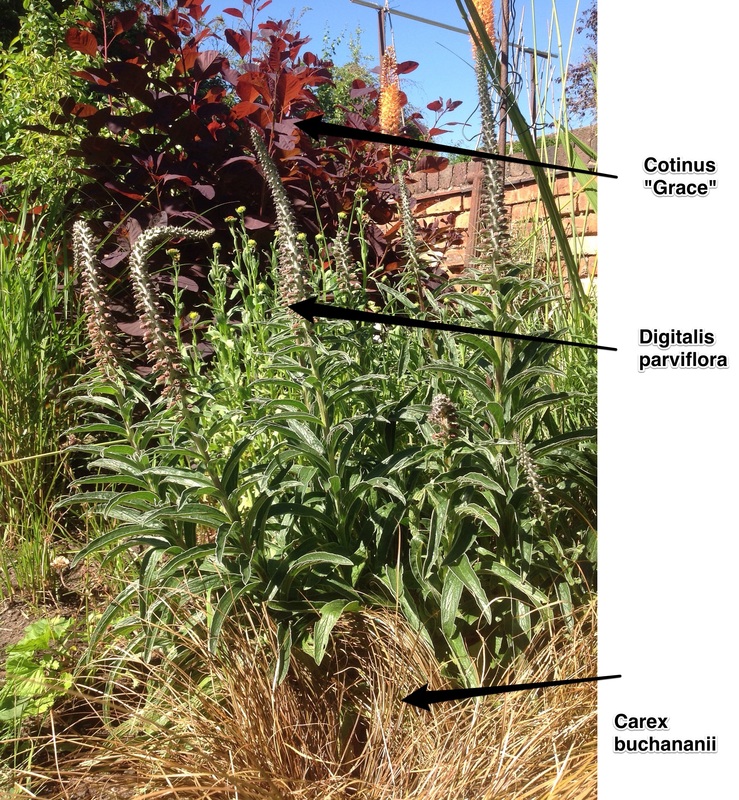 The border was redone as a “Champagne border”, trying to reproduce Luciano’s Laurent Perrier garden. Thankfully, they fit in with the scheme – they’re the bubbles! 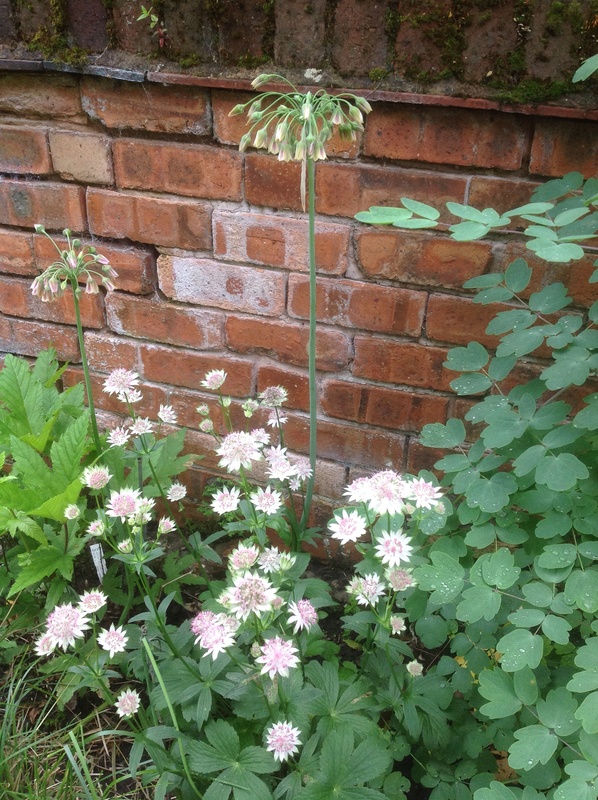 The Nectaroscordum, now that they are flowering, has thrown up an unexpected plant combination, with Astrantia “Buckland”. The colours mirror each of them, creamy white tinged with pink and green. A pleasant surprise! This is definitely my favourite flower – at least today! Sadly, these 2 pictures were taken only 1 day apart. Maybe that’s why it’s my favourite – because it’s so fleeting, and longed for. Thankfully, I have more buds. Isn’t the colour so dramatic? 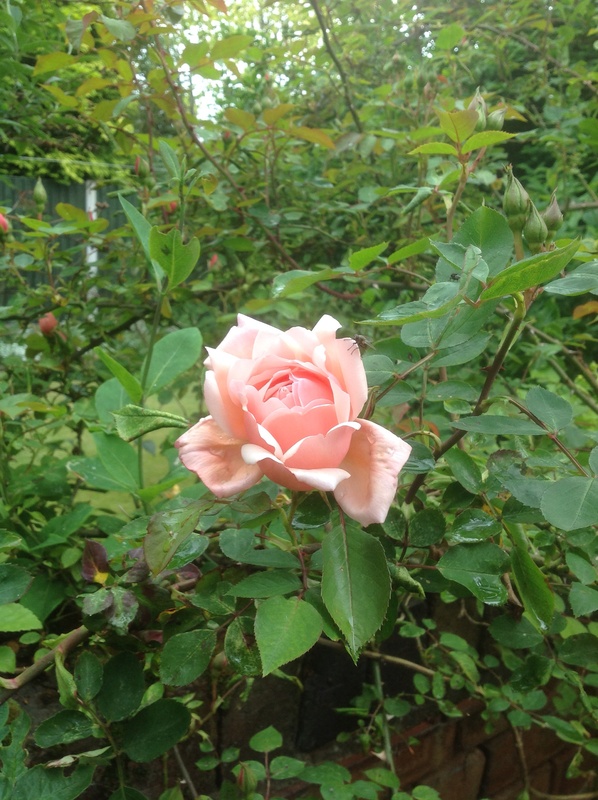 And the first of my roses have started to bloom. Think of this as a taster. I hope to do a future post on my roses. 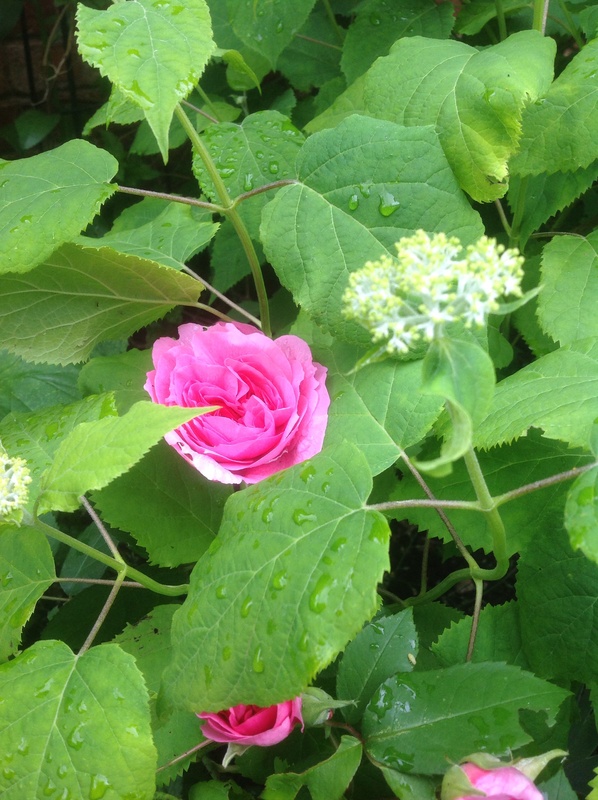 The pale pink one is our rambler, rosa “Albertine” and the deep pink one is the beautiful English rose, “Gertrude Jekyll”, nestled among more emerging buds, of Hydrangea “Annabelle”. 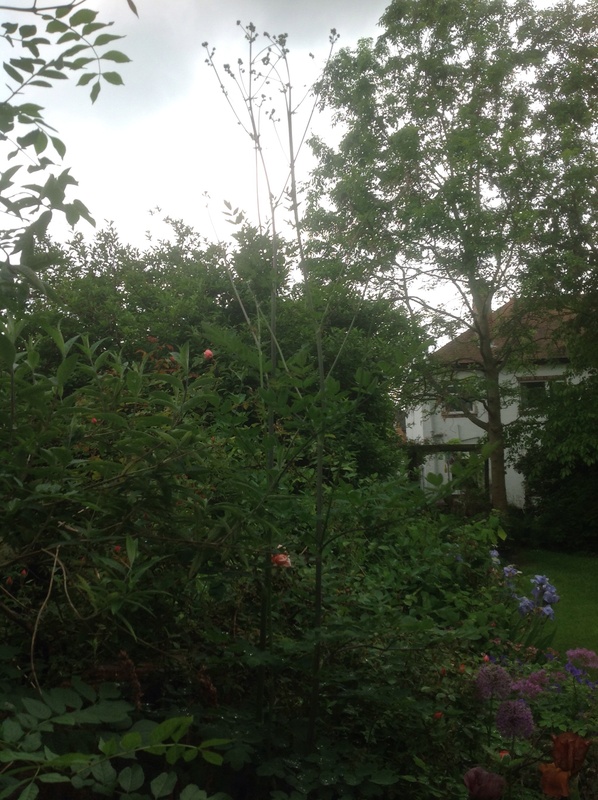 And two more recently burst buds. They certainly demand to be noticed! 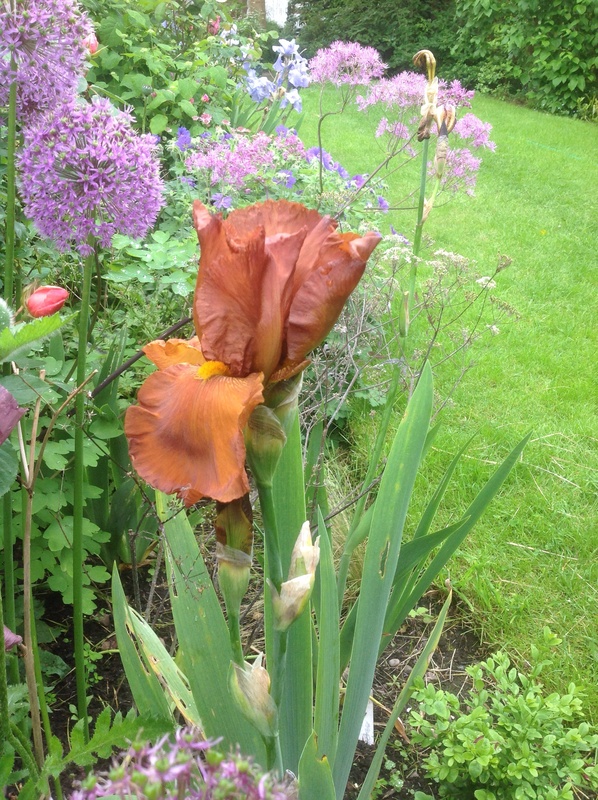 P.s the iris smells like it looks – chocolate/orange! Mmm! And what do you make of this? 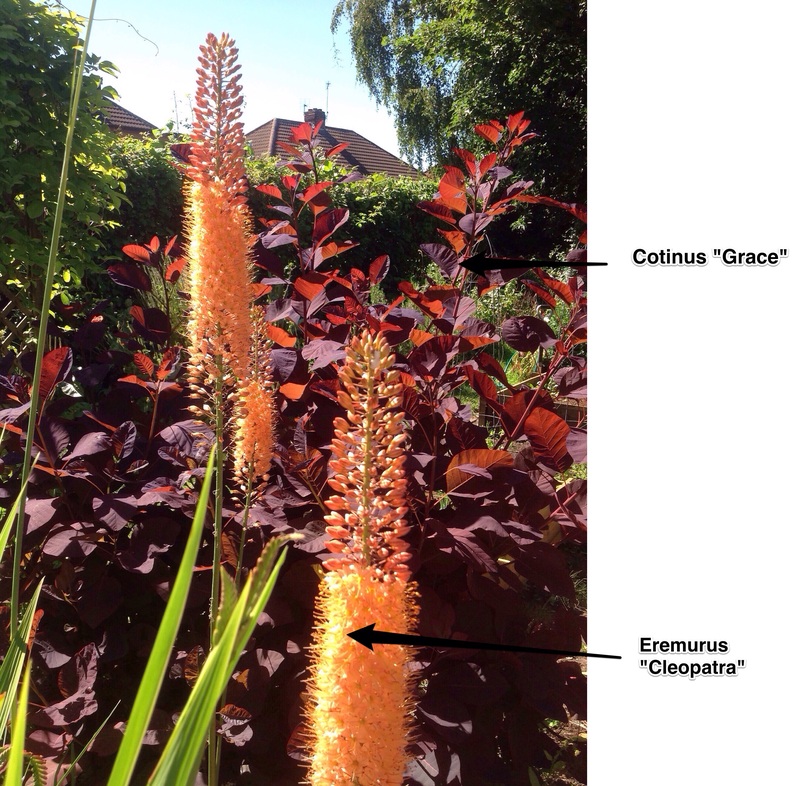 This is the flower spike of Thalictrum “Elin”. I checked – it’s supposed to reach 6 ft. This is more like 10 ft. Honest, I’ve not been feeding it steroids! And on that lofty note, I’ll say bye for now! 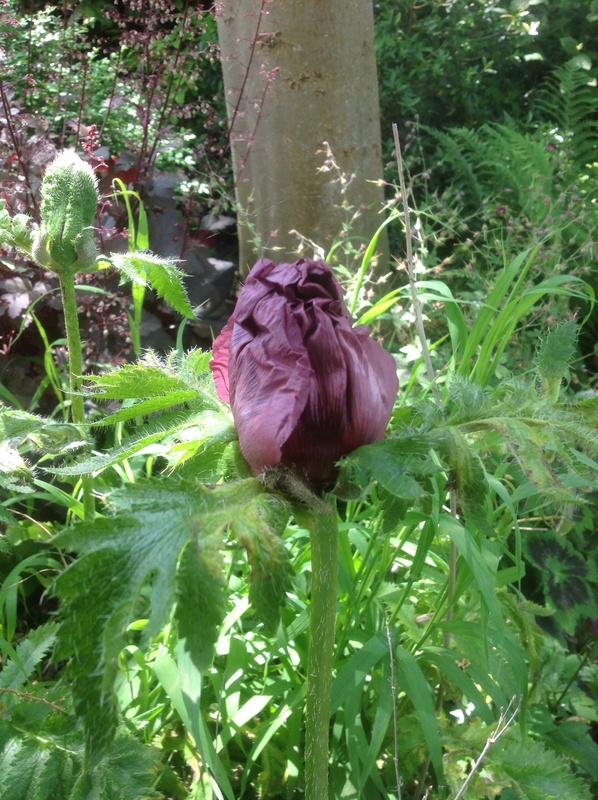 I’m off to see what else is blooming lovely! This entry was posted in Uncategorized and tagged Allium, Angelica, astrantia, Champagne border, Cottage border, Iris, Nectaroscordum, Oriental poppy, Roses, Thalictrum on June 4, 2014 by thelonggardenpath.